The day of our arrival we spent preparing Freja for the trip together with Lasse and Lisa. In the evening also Mats and Sussi arrived and we had a good dinner at our favourite restaurant before hitting the sack, it had been a long day for all of us. Sunday morning we left the harbour early for the close by bay Ormos Thorikou where we had breakfast and a swim in the warm clear water. Wonderful after the bad summer in Sweden. 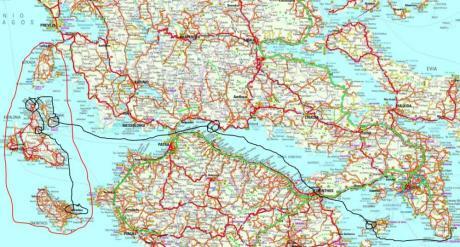 Now the trip started and the goal was Skiathos in the Sporades islands. 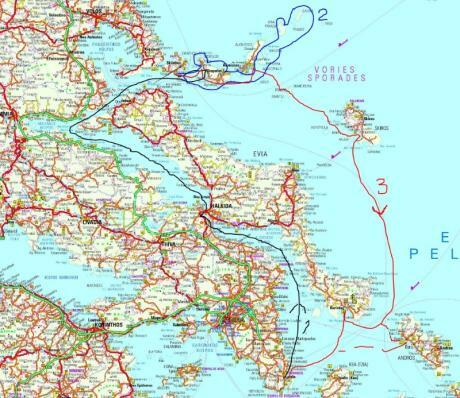 The recommendation was to go on the inside of Evia and avoid going north through the strong currents in Steno Kafirea between Evia and Andros. But we also had to make sure that the bridge in Khalkis would open the evening we got there and that we were on time. We called ahead before leaving Lavrion and got a positive confirmation but then we almost arrived too late, it was a close call and we raced against the clock all afternoon and early evening and just made it. The reason we were late was due to strong head winds on the first day which prevented us from reaching our target the Boufalos bay. Instead we found a good place in Ormos Animboriou on Evia. The unfavourable winds continued also the next day and since Freya's engine is a bit on the weak side with only 27 horse powers we had to tack against the wind with engine and the main sail set. When the wind increased we decided to sail and set the Genoa jib. Then the knot holding the port sheet became undone and we had to retreat behind a small island to make repairs and lost more time. Now the race started. We had information that we needed to report to the Port Authority and pay the fee latest by 20:00h. At 19:45h as we passed the high bridge south of Khalkis I called them (22210 28888) to say we were late but got the reassuring answer that they were open 24/7. Still we had to hurry not to miss the bridge opening that evening. We made it but with very little time to spare. Passing the bridge was an interesting event. We first left the Khalkis marina and moved to the bay on the mainland side. 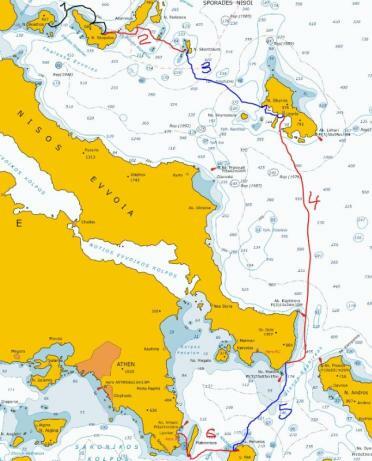 There I did a radio check as ordered on the VHF channel 12 (first time we ever used the VHF) and my 18 years old knowledge of radio communication from the UN mission in Syria/Israel/Lebanon clicked in automatically "Port Authority Khalkis Sailing Yacht Freja calling, radio check over" etc. Some 5 other private boats and a small freighter were waiting in the dark to pass the bridge which by the way has been there in various forms for some 3000 years! Quite soon some communication in Greek came over the radio and the freighter started moving and then the boats were called up one by one and told to move forward. The bridge is in the middle of Khalkis which meant that we had a lot of spectators watching and cameras were going off both from the boats and the shores as we passed the open bridge. After passing the bridge we found a spot on the town quay some 400m north of the bridge where we moored for the night. The next day we continued to Limni, a small nice town on Evia. Headwinds as always so the tacking took us all the way to a long bay on the mainland where we had a very Swedish lunch on pickled herring, potatoes, beer and Danish snaps and lots of dips in the warm water. Entering the port i Limni was a bit exiting as the entrance normally is very narrow and requires a 90 degree turn according to the Greek Waters Pilot but this time 3 rather big fishing boats were moored on both the inside and outside of the pier making it impossible to see where we going until the very last ½ minute or so. I wish you Happy Sailing !!!!! 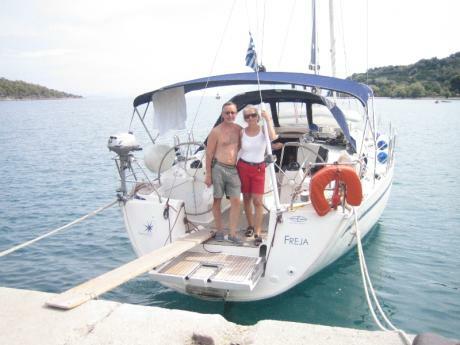 Freja is a Bavaria 40, 2009 model year but delivered early 2010. 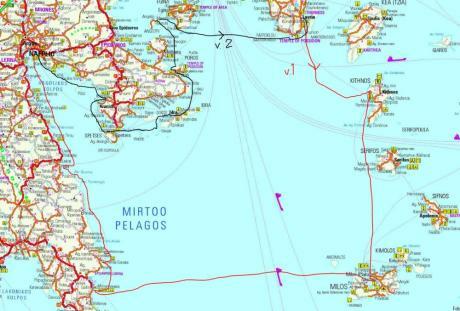 She is for the time being part of Navigare-Yachting’s fleet of bareboats (charter) in Lavrion, Greece. The Bavaria boats are not the most beautiful or sail the best but there is lots of space on board and you get a lot of boat for your money. We believe you must have a relaxed view or dissociate oneself from your boat when it’s in the Charter business or you will suffer too much when you see the wear and tear she is suffering from - even though Navigare-Yachting is keeping her in good shape. We don’t know if we will sell her or keep her when the contract period runs out. Maybe we will be too old by then to have a boat of this size in the Med and will change to a smaller boat in our home waters in the Stockholm archipelago? Back at work during some quite weeks in the summer of 2009 I started investigating to possibilities to invest in a bareboat in Greece. During the trip in 2008 to eastern Greece we were at one point moored next to a Swedish ex Bare-boat. It had just finalized 5 years as a charter boat. My more knowledgeable friends took a closer look on board and came back with a very positive verdict of the boat’s condition. That was when buying a boat for charter became a real option for me. That summer I checked out 3 companies, Moorings, a big Greek company and finally decided for the Swedish company Navigare-Yachting AB. The main reason was that the company is stressing its high quality boat maintenance – which we had experienced during 4 sailing trips to Greece and Croatia and also the fact that it was Swedish and any serious problem would be settled in a Swedish court of law would it ever have to come to that. We chose a 40feet Bavaria which was the smallest available to minimize the step up in size from our normal boats (28feet) and also due to the money aspect. This we have so far not regretted. The decision lead to a hectic period with arrange the loan in the bank (mainly in euro) and taking the necessary navigational and VHF radio courses during evening classes. 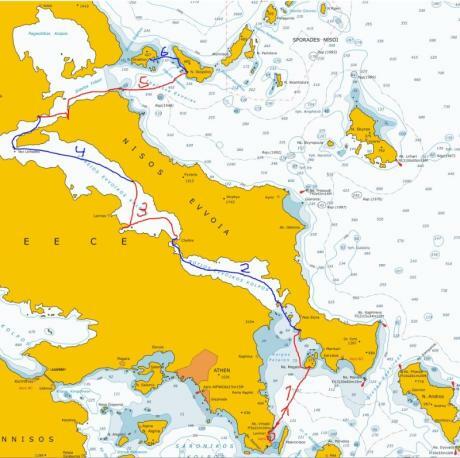 The first sailing trip was booked for week 16 in 2012 when Navigare was arranging a new boat owner training course during 3-4 days, something we thought was absolutely necessary for us when making this big step from 28 to 40 feet. 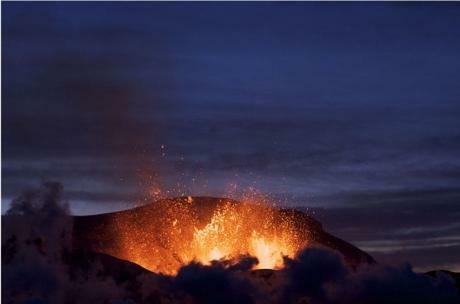 Then 2-3 days before the trip the volcano ashes from Island grounded all flights and we were stuck at home. I think you can easily imagine our disappointment! We would now have to wait another 5 months to do our maiden voyage on Freja and by then she would already have sailed some 20 weeks or so with strangers. I have since learnt that the strangers are our very important customers and you should be happy with all you can get but in the spring of 2010 my feelings were more basic and selfcentred. At last it was time for our maiden voyage in September 2010. On Monday the last week at home we came to finally realize that it was time for our beloved dog Primus to go to sleep for ever. His health status had gone from bad to worse but we had not wanted to see it. The day after we made an appointment with the animal hospital and on Wednesday we made the heavy trip to the clinic. Much to do at our workplaces to prepare for 2 weeks away, including also a party for both of us, the distress of losing Primus and only just over 3 hours of sleep the last night had us very tired when we arrived in Athens on Saturday morning. We were met at the airport by our very knowledgeable sailing instructor Olle A. who we had got through Bodil at Navigare-Yachting. Olle was to teach us in 24 hours the most important things we should have learnt during the Boat-owner introduction course that was cancelled in the spring. 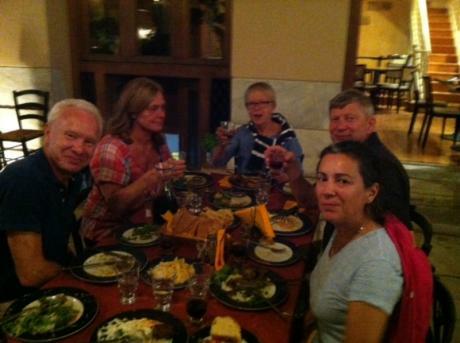 We started practising after a Greek salad and a quick briefing with mooring stern to – something we had never done in Sweden. It didn’t go that well and a person in the next boat said the following morning: “ we saw you and said to ourselves– these guys have a problem”! At 19.00h we suddenly remembered that we needed to stock up at the recommended supermarket which would be closed the next day. Just under 1h to shop for 6 persons for one week! Luckily Olle had a car and knew the shop. 15 minutes after closing we were forced out of the shop less 300€ and a blocked credit card. I had forgotten to open it up for purchases abroad so no wander it didn’t work with the PIN code. Back at Freja with the goods stowed, Lisa wanted to sleep but I was hungry and said that we must eat. We ordered a fresh fish at the nearby restaurant, it took for ever and was very expensive. We went to bed at last in a warm cabin with the waves lapping against the hull and the Greek music coming in through the open hatch over our heads. We didn’t sleep much. At 5 the music stopped and at 8 Olle arrived and the training continued. Our crew the good old friends Thomas and Monica and the slightly newer friends Jan and Monika arrived with the morning flight and we set off after lunch for Korissia on Kea. We sailed close to a steadily increasing wind and sea and seasickness arrived as securely as a letter in the mail (in the old days) to the Captain. The very knowledgeable crew (a wise choice) had to take command of the mooring. After hardly being able to force down 2 bites of food I gave up and went to bed. I remember I felt so awful that I was prepared to sell Freja and give up all plans of sailing at that moment. The next day we made short trip to the Orgias bay on northern Kea were we swung on the anchor until the next day and just had a good time and got our strength back. Niiiiice! This is a good place to stay with southerly winds. 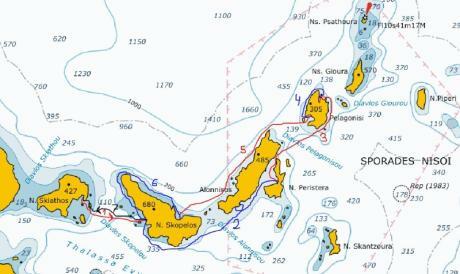 The following day we continued to Loutra on Kythnos and I passed my first own mooring. The girls went exploring=shopping after a Gin &Tonic “GT” mooring drink and us guys swam across the little bay to the hot spring outlet and had a nice hot bath in the sea. Cosy. Loutra is a place to return to. Wednesday we mainly motored to Finikas on Siros. There was only room for us on the outside of the quay and the increasing southerly wind was threatening to push Freja on to the concrete. She was heaving strongly and we had to organise an anchor watch until things quieted down at about 2 in the morning and everyone could get some sleep. The water in harbour was good and clear, “swimmable” but we were not too impressed with the little else we saw of the harbour area. On Thursday we continued in yet again very good weather to Livadhi on Serifos. Livadhi is a really nice place. The next morning we took the local buss up the hill to the old town centre and enjoyed the spectacular view of the south eastern Cyclades. We had a good tasting breakfast in the little café run by a young woman who had returned from Athens, she will probably be followed by many more now in this time of crisis for Greece. 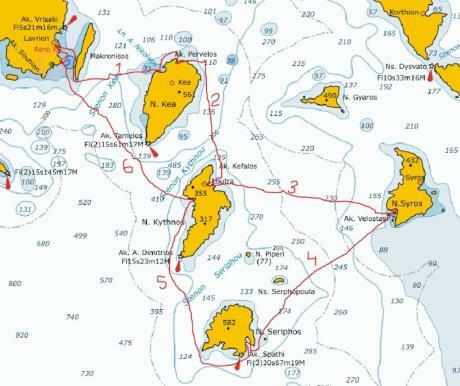 Then we walk down to Freja and sailed on to Sandy Bay on Kythnos were we had a swim and a very nice dinner on board. The last day we got some rain but also a good strong wind and sometimes logged +7 knots. We took the last dip in a bay 2-3 nautical miles south of Lavrion and closed the evening in a pleasant looking restaurant in the pedestrian precinct which since has become a favourite haunt. Sunday morning our very nice and satisfied crew left us and returned to Sweden.